Hunter, author, and actor James A. Swan lives what he writes about as he displays two beautiful rooster pheasants taken at Camanche Hills Hunting Preserve, near the town of Ione, California. 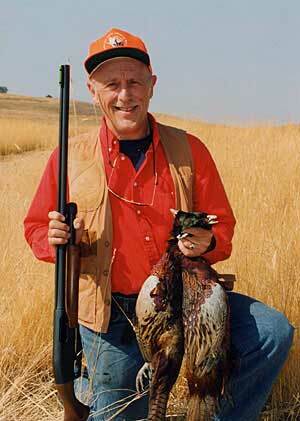 Swan and WesternHunter.com editor Jerry Springer were on an early-season pheasant hunt in 1999. Swan may be more familiar to hunters by his books, In Defense of Hunting, and The Sacred Art of Hunting. WesternHunter.com has arranged with Swan to allow our readers to get autographed copies of Swan's books by ordering them directly, using the information below. In addition, the books are available at bookstores and online. Orders $10-$30 add $3.00; Above $30, add $5.00; California residents add 7% sales tax.